My friends and I were thrilled to discover Ned Ludd in Portland. We went there on a chilly, rainy Sunday evening after a day of exploring Portland’s cheese, chocolate and wine shops. What a delight to walk into this light-filled, welcoming space that was warmed by the fire from a large brick wood-fired oven. The staff was ultra-friendly, suggesting several dishes and wines for us to try. The chef, Jason, came over multiple times during the evening to chat and make suggestions, as well. The menu there is laid out into Forebits, Kaltbits, Warmbits and Plats. There were three of us, and we were so thrilled by the menu choices that we ordered 9 dishes to share, along with a bottle of Love & Squalor’s 2007 Riesling from Willamette Valley. We started with Endive, Smoked Trout, Lemon Cream and Chives. The trout was smoked in-house and was light and delicate with a smoky, earthy flavor. The Roasted Radicchio, Roasted Butternut Squash, Brown Butter and Balsamic presented a perfect balance between the bitterness of the radicchio and the sweetness of the butternut squash. One of our favorite dishes was the Turnips in Horseradish Cream. 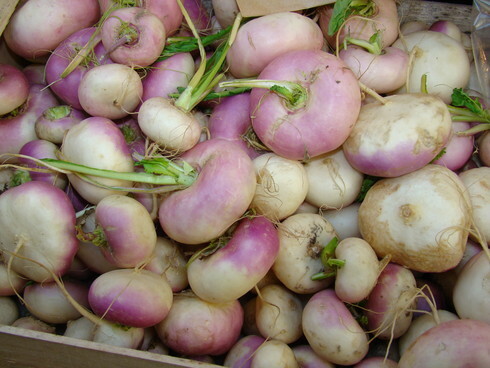 The turnips were sweet and tender and paired well with the creamy, mildly-spicy sauce. Of course, we had to try the Mornay and Elbows (macaroni and cheese) – this dish did not disappoint. One of the favorite dishes of the night was the Acorn Squash, Bacon and Molasses. It was created with Ben’s in-house-cured bacon, which was thick and smoky. (Would like to have taken home a few pounds of that bacon!) We loved the Mustard-Braised Brussels Sprouts, as well as the Spicy Pork Cabbage Roll. One of our favorite choices was the Plate of Roasted Winter Vegetables with Herb Sauce. Our final dish was the Slow-cooked Shoulder and Spicy Sausage of Pork, Sweet Onions and Kale. This dish was good, but had a little too much garlic for my taste. However, the meat was very tender and flavorful. At the end of the night, we got the bill and could not believe it came to only $110! It was an incredible meal with a good bottle of wine at an excellent price in a warm, friendly environment. I can hardly wait to go back! 3925 Martin Luther King, Jr. Blvd.